Symbolizing society's nearness to self-destruction, the Doomsday Clock was created in 1947, just a few years after the U.S. dropped the bomb on Hiroshima and Nagasaki. A board of directors working for the University of Chicago and the Bulletin of the Atomic Scientists journal devised this clock in response to the increasing threat of nuclear war instigated by the instability of post-war relationships involving the Soviet Union and its allies. These directors set the clock initially at 11:53 pm, or seven minutes before midnight, with midnight representing the expected moment of destruction. Since then, it has been reset several times and currently rests at 11:55 pm due to the increasing prospect of regional nuclear conflict, global climate change and worldwide economic instability resulting in the collapse of civilization. The closest to midnight the clock had ever been set was two minutes to midnight in 1953, when the U.S. elected to develop the hydrogen bomb, a device capable of releasing 450 times more energy than both atomic bombs dropped on Japan in World War II. The decades following the late 1940s have experienced additional scenarios potentially inflicting enough damage on the world and its inhabitants to produce the end of life as we know it. Adjusting to this changing landscape of catastrophes, the Clock now takes destructive weather-related events into account that are thought to be the result of rising temperatures, abnormally rapid warming of ocean waters and excessive drought. As a recent but genuine threat to human life, bioterrorism is also factored in with these other variables whenever the Clock is reset. 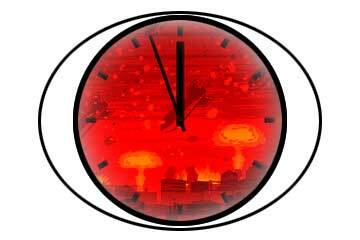 The eminent threat of nuclear war has always provoked the Clock setters into pushing the big hand closer to midnight. Several times during the early 1950s and 1980s, the clock revealed settings ranging from three minutes to six minutes due to strained Soviet-U.S. relations. Probably feared more than any other disaster, a WMD attack, weapons of mass destruction, consisting of nuclear bombs, contain the ability to reduce the world to ashes and kill millions of people from the effects of nuclear fallout and nuclear winter on human health. While early information regarding nuclear attack survival methods consisted primarily of building a survival shelter and the useless "duck and cover" suggestion, scientists studying the effects of nuclear war following the Nagasaki/Hiroshima bombings now realize that more complex preventative measures need to be taken in order to survive the pernicious, long-lasting consequences of radiation. Surviving a nuclear attack means addressing electromagnetic pulse issues, or the massive burst of energy immediately following the explosion that disrupts all power sources. Computers, automobiles, and heart pacemakers are all likely be affected by an EMP weapon. Employing EMP protection procedures prior to an EMP attack may prevent some items from succumbing to an EMP threat. In addition, EMP shielding measures are currently being developed by the U.S. government to avoid a catastrophic failure in vital communication systems. Massive tornado outbreaks, extensive flooding and droughts, debilitating ice storms and tsunamis have all affected widespread areas of the world in the past decade with increasing frequency and intensity. Although not commonly thought of as a doomsday device, natural disasters have the capacity to wipe out millions of lives and cause irreparable destruction. Greenhouse gas concentrations, especially carbon dioxide, are at their highest level now than at any time in the past 600,000 years. By abnormally warming the oceans and land, this "greenhouse affect" is producing climatic turbulence that directly generates ecological changes and intense weather patterns. Rising sea levels, coastal erosion, powerful supercells spawning F5 tornadoes and extremely dry conditions in areas already lacking in rainfall are capable of resetting the Clock. Viruses, bacteria and neurological toxins are agents potentially used in an act of bioterrorism. If released in heavily populated areas by terrorists, highly infectious diseases such as smallpox, anthrax, plague and viral hemorrhagic fevers (Ebola and Marburg) could potentially be "slate-wipers", killing millions of people and creating global chaos in a short period of time. Chemical terrorism employs agents that are released from "bombs" that do not cause destruction but send substances into the air where they are inhaled by humans and animals for the purpose of causing severe health issues, unconsciousness and death. Nerve gas (Novichok agents), blistering agents, chemicals causing heart and lung issues (chlorine and hydrogen chloride) and tear gas are just some of the substances capable of sickening whole populations. However, adequate preparation for bio-attacks that involve building a survival shelter and obtaining a chemical warfare suit can help reduce the effects of dangerous toxins. Unfortunately, resetting of the Doomsday Clock appears likely to continue as long as weapons of mass destruction exist, climate instability worsens, and nations remain reluctant to discuss peace.